19 When Herod died, an angel of the Lord appeared in a dream to Joseph in Egypt. 20 “Get up!” the angel said. “Take the child and his mother back to the land of Israel, because those who were trying to kill the child are dead.” 21 So Joseph got up and returned to the land of Israel with Jesus and his mother. A warm sun is shining from the left, which infuse the scene with warm yellow tones. Shadows are deep & dark, due to the strong sunlight with cast shadows having a blue hue. Joseph at the head of the donkey. Mary to the left, with the infant Jesus in a wicker carry cot, under a make-shift shade on the donkey’s back. 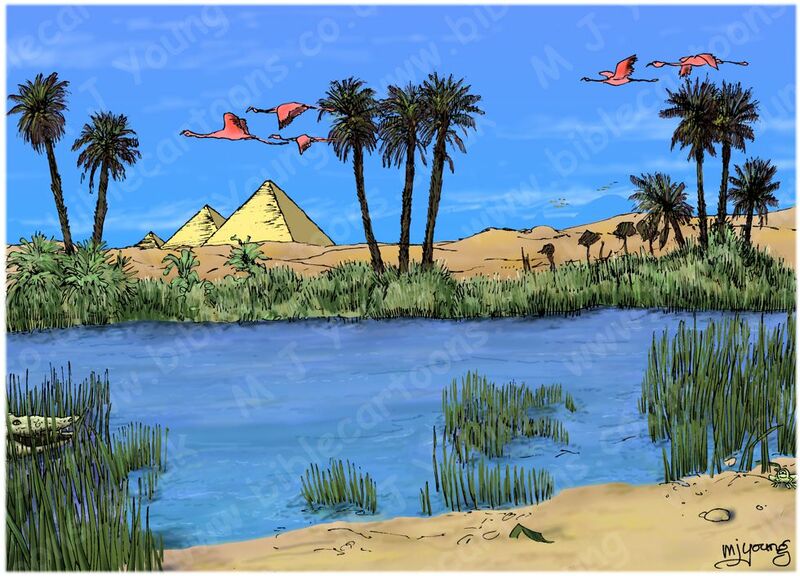 There is a Nile crocodile in the reeds on the left of the scene. There is a reed frog in the reeds on the right of the scene. There are two versions of this scene. This is what I call the “Colour version.” The sky & river Nile have strong blue hues, which counterpoint the warm yellow & browns in the pyramids, desert sands & figures. 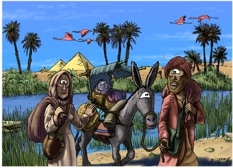 As noted in the ‘Matthew 02 – The Nativity – Scene 12 – Flight to Egypt’ cartoon, the Bible doesn’t say exactly where in Egypt Joseph, Mary & the infant Jesus fled to. I have chosen to depict them near the Nile rive, with the great pyramids of Giza in the background simply because many viewers will instantly recognise where the characters are with them in the background. I have reasoned that Mary & Joseph might have made better travelling arrangements upon their return to Israel than on their departure from that country. They left in a hurry, in the night, presumably with little chance to think about how to get an infant to Egypt. But on this planned return, I have shown them with the infant Jesus in a wicker carry cot, securely tied on the back of the donkey. Jesus will be protected from the fierce sun by a make-shift shade over his cot, on the donkey’s back.